Jane's life is far from perfect, but she certainly doesn't think anyone would ever try to kill her. She's popular, pretty, and has a great boyfriend and two best friends. Yet when she wakes up in the hospital the morning after a big party, a victim of a hit and run and unable to move or talk, it's obvious to her that someone wants her dead. She can't remember the details of the night before, and everyone is telling her a different story. With just snatches of memories and confusing feelings she can't explain, Jane will have to figure out who was behind the attack—before they strike again. Rosebush is a complex and detailed mystery that will literally keep you guessing until the final chapter. Jane's narrative hops around quite a bit between the past and present, and recollections of her life before high school crop up frequently, but Jaffe does an excellent job at balancing these scenes with those of Jane’s recovery in the hospital. She keeps the book moving along quickly, revealing memories and events that will force you to constantly change your theories and re-evaluate your opinion of Jane and who might be after her. As a character, Jane isn't the most likable person in the beginning—she is blinded by popularity and she cares too much about what others think of her, but she is a kind person who cares about others, clever, and honest. The danger she is in feels real, despite those characters that suggest it's all in her head, and as the killer draws closer, the suspense heightens and the experience changes the way Jane sees her life and how she feels about those in it. By the time all of the details come together perfectly in a tense and gripping ending, the identity of the culprit won't surprise you because everyone has a motive and has become a suspect. 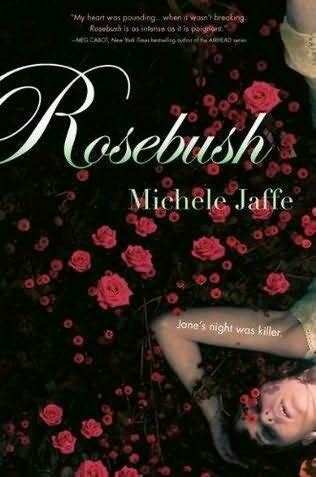 Rosebush is a thrilling, deadly mystery with unexpected bits of humor and an impossible-to-guess conclusion—don't miss it. Cover Comments: I love the roses and the way the model is tangled in them at odd angles. It's so significant to the book and it really draws you in, similar to the cover for All Unquiet Things by Anna Jarzab. In that first glace there is that moment that you think, "Is she...? No..." It just demands a closer look! I'm glad to hear good things, since I love Michele Jaffe and can't wait to read this one. Excellent review! I have now added this book to my list of TBR. Good, I'm glad you reviewed this one positively. I just started it yesterday, though I'm only five pages in. I agree with Alison, I like the transformation of the popular girl. Love the cover! Rosebush has been completely distorted the story. Michelle Jaffe wrote a fantastic thriller with this, and I would not mind reading more books like this one.